Cucina Antica Foods exhibited its classic line of all-natural cooking sauces, imported artisan pasta and extra virgin olive oil, along with the newly added organic line of salad dressings and ketchup at the 2012 Natural Products Expo West trade show in Anaheim, CA. Natural Products Expo West is the world’s largest natural and organic products tradeshow, where exhibitors can showcase new products to tens of thousands of industry professionals. Cucina Antica Foods has exhibited at this show for several years to connect with retail store buyers, co-ops, distributors and brokers. 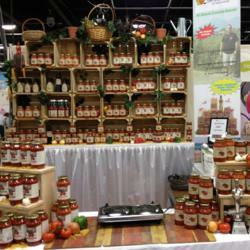 Cucina Antica Foods Corp. is a family owned and operated company located in Westchester County, New York. For over 14 years, Cucina Antica Foods Corp. has provided families with all-natural, fresh sauces as well as donations and support for families in need. Recently an organic line of dressings and ketchup has been launched. For more information, please visit http://www.cucina-antica.com.